eDreams.es: Guesthouse Hostal Playa de Palma , Playa de Palma, Spain - 49 Guest reviews . Book your hotel now! Lock in a great price for Hostal Playa de Palma – rated 8.2 by recent guests! Super Hostel (Hotel) in der nähe zum Ballermann. Mega freundliche Chefin und top Personal. Egal zu welcher Uhrzeit ;) - immer hilfsbereit, freundlich und engagiert. Es hätte nicht besser sein können. Vielen Dank nochmal! Die Rezeption war einzigartig freundlich und zuvorkommend. Alles war perfekt! Für ein Wochenende vollkommen ausreichend, freundliches und nettes Personal. Meine Erwartungen definitv übertroffen (Hohe Anforderungen an ein 1* Hostal hatte ich allerdings nicht). Großzügiges Zimmer - perfekt für die Reise zum Zentrum des Ballermanns! Die Betten waren sehr bequem, das Frühstück gut und ausreichend. Maria war sehr freundlich und hilfsbereit. Öffentliche Parkplätze nicht immer leicht zu finden, obwohl wir in der Nebensaison dort waren. Strandnah gelegen, vom Balkon aus ist das Meer zu sehen. Gutes Preis-Leistungsverhältnis, Lage ist optimal, man ist schnell am Strand und an vielen Lokalitäten. Zimmer sind einfach ausgestattet, für einen Aufenthalt von 3 Tagen aber vollkommen ausreichend. Zimmer waren immer sauber, Personal wirklich sehr freundlich. Essen super und für Langschläfer auch ein spätes Frühstück. Rundum gelungen! Personal sehr freundlich. Ab Ende April hat die Bar im Hotel und die Rezeption 24h auf. Man kann Nachts noch etwas kostengünstig trinken oder etwas essen. Check In und Check Out waren problemlos. Hostal Playa de Palma This rating is a reflection of how the property compares to the industry standard when it comes to price, facilities and services available. It's based on a self-evaluation by the property. Use this rating to help choose your stay! This guesthouse is located just 300 feet from Playa de Palma Beach, less than a 10 minute drive from Palma Airport. It offers a 24-hour front desk and rooms with a balcony. The rooms at the Hostal Playa de Palma feature tiled floors and simple, modern décor. Each one comes with a safe and a private bathroom. The Playa de Palma has a bar with a terrace. There is also a snack bar serving drinks and light meals. The staff at the front desk can provide information about what to see and do in Mallorca. Car and bike rental are available, and an airport shuttle service is available upon request. Central Palma is a 15 minute drive from the guesthouse. Playa de Palma’s main promenade is just a 5 minute walk away. 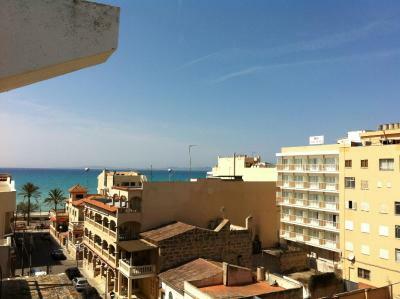 뀐 Located in the top-rated area in Playa de Palma, this property has an excellent location score of 8.6! When would you like to stay at Hostal Playa de Palma? This simple room includes a balcony, a safe and a private bathroom with a shower. This simple room includes a balcony, a safe and a private bathroom with a shower. It has a double bed and a 3rd fold-away bed. House Rules Hostal Playa de Palma takes special requests – add in the next step! Hostal Playa de Palma accepts these cards and reserves the right to temporarily hold an amount prior to arrival. Only a customer who has booked through eDreams and stayed at the property in question can write a review. This allows us to verify that our reviews come from real guests like you. Who better to tell others about the free breakfast, friendly staff, or their comfortable room than someone who’s stayed at the property? Contributions to eDreams are a reflection of the dedication of our guests and properties, so we treat them with the utmost respect. After a review has been submitted, you can modify it by contacting eDreams customer service. We'll allow the contributions to speak for themselves, and we won’t be the judge of reality. eDreams’s role is to be a feedback distributor for both guests and properties. These guidelines and standards aim to keep the content on eDreams relevant and family-friendly, without limiting expression or strong opinions. They're also applicable regardless of the comment's tone. Contributions should be travel related. The most helpful contributions are detailed and help others make better decisions. Please don’t include personal, political, ethical, or religious commentary. Promotional content will be removed and issues concerning eDreams’s services should be routed to our Customer Service or Accommodation Service teams. All content should be genuine and unique to the guest. Reviews are most valuable when they are original and unbiased. Your contribution should be yours. eDreams property partners should not post on behalf of guests or offer incentives in exchange for reviews. Attempts to bring down the rating of a competitor by submitting a negative review will not be tolerated. Respect the privacy of others. eDreams will make an effort to obscure email addresses, telephone numbers, website addresses, social media accounts, and other similar details. The opinions expressed in contributions are those of eDreams customers and properties, and not of eDreams. eDreams does not accept responsibility or liability for any reviews or responses. eDreams is a distributor (without any obligation to verify) and not a publisher of these comments and responses. eDreams B.V. is based in Amsterdam in the Netherlands, and is supported internationally by 198 offices in 70 countries. Copyright © 1996–2019 eDreams™. All rights reserved. eDreams is part of Booking Holdings Inc., the world leader in online travel and related services. © 1999 -2017 eDreams. Todos los derechos reservados. Vacaciones eDreams, S.L., Sociedad Unipersonal. Passeig Zona Franca 191-205, 08038 Barcelona, Spain. CIF B61965778. Registro Mercantil de Barcelona, Tomo 31908, Folio 69, Hoja B – 200680, Inscripción 1. Licencia de agencia de viajes GC88MD. *Estos son los precios más baratos encontrados a través de nuestros buscadores durante los últimos 5 días. Los precios de los vuelos corresponden a billetes de solo ida o a la tarifa media de los billetes de ida y vuelta, con una compañía aérea regular, para un adulto, en clase turista y con una fecha de salida inferior a 45 días a partir de la fecha actual. Los precios de Vuelo + Hotel corresponden a billetes de ida y vuelta, con una compañía aérea regular, para un adulto, en clase turista, con una fecha de salida inferior a 45 días a partir de la fecha actual e incluye 2 noches de estancia en un hotel de tres estrellas para un adulto en habitación compartida. Los vuelos pueden incluir escalas de larga duración, aeropuertos secundarios y horarios inusuales. ¡Te invitamos a utilizar nuestros buscadores para encontrar los mejores precios para ti!